In Walking with Jesus: A Way Forward for the Church, Pope Francis's own words lead us to the answer. Francis urges us to make Jesus central in our individual lives and in the collective life of the Church—to walk toward him, and ultimately to walk with him at all times and in all places. Each chapter of this Vatican-authorized book helps us put one foot in front of the other as we move ever closer to God and to our neighbors through the sacraments, prayer, evangelization, the gifts of the Spirit, and service to others. Francis reminds us that while the Church is indeed made up of individual people, we must walk together as a community of believers in a transformative relationship with Jesus if the Church is to be an effective, faithful witness to the Gospel. With a foreword by Archbishop of Chicago Blase J. Cupich, Pope Francis's first major appointment in the United States,Walking with Jesus offers the Church a much-needed way forward, past its inner and outer walls, as it fearlessly follows Christ toward the future. - James Martin, SJ, author of Jesus: A Pilgrimage. Walking with Jesus offers a carefully selected collection of recent homilies, discourses and messages of our astonishing Pope Francis. The excellent translation captures the remarkable humanity, turns of phrase, metaphors and imagery of a pope who is second to none as communicator. Expert editing makes each selection a real treat, accessible and easy to read, while inviting you to reflection and prayer. What a wonderful addition to our knowledge of the fresh and inspiring message of a revolutionary pope from 'the ends of the earth!'" "Growing up on the gritty streets of Chicago’s West Side, I was taught to never walk alone. The same advice holds true for the spiritual journey and Pope Francis shows us how to walk with Jesus every step of the way. Thank you, Holy Father, for reminding us that, with Jesus at our side, we have nothing to fear!" "Making an important contribution to the new evangelization, Walking with Jesus weaves together the major themes of Pope Francis’s pontificate centered around the encounter with Christ. The perfect companion for those seeking to grow in their relationship with Christ, the Sacraments and the Holy Spirit, Walking with Jesus is sure to inspire you to follow in the footsteps of Pope Francis to grow in your faith." 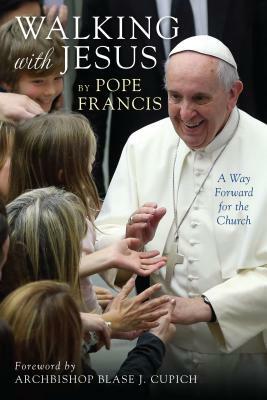 "A wonderfully inspiring and stirring resource capturing the depth of Pope Francis's magnificent vision and mission. His powerful message speaks of the richness of Catholic story and tradition. Walking with Jesus: A Way Forward for the Church is an exceptional source of wisdom and guidance for all involved in the ministry of religious education."